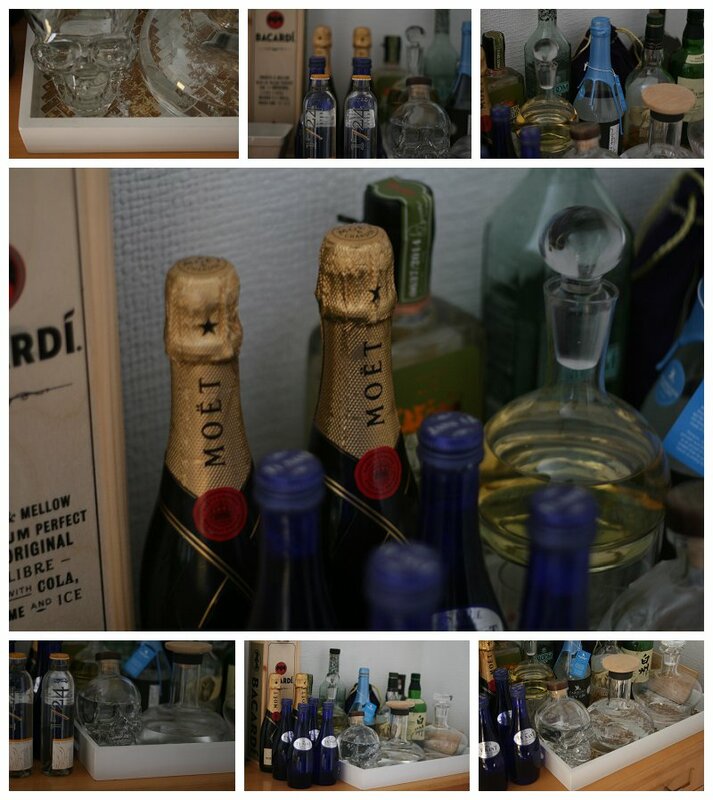 One of the most used spaces in our house is the drinks station, which lives on the sideboard in the dining room. I know the cool thing to do is have a bar kart, but we have more of a bar corner and we love it. And I think as home bar corners go it's a pretty well stocked one. 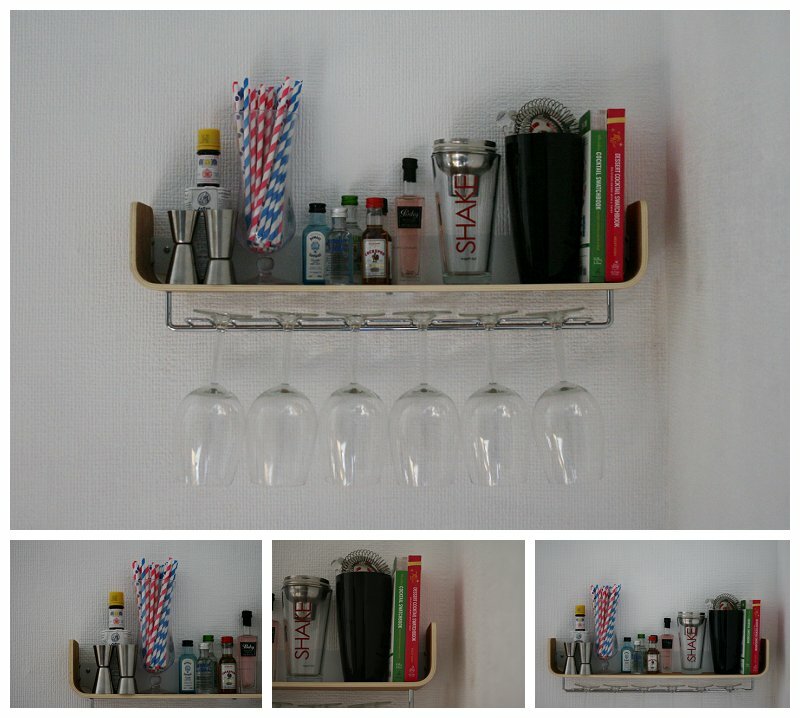 The main bits of our bar live on a cute little tray that I lucked out on finding in T.K.Maxx. I love the shell mosaic on it and the fact its a little blingy. The tray itself houses our decanters, which were gifts from people. One has gin in it, one should have whisky (but it's all been drunk), and the one with the shot glasses beneath it - tequila of course. Along side the decanters we have a bottle of Crystal Head Vodka - which amazingly was a housewarming gift from my lovely friend Liz, 4 different gins including a delicious elderflower gin and a Cornish gin we picked up on holiday, oh and 3 different whiskies, two rums and some champers too. All bases covered then! And the shelf, well this Universal Expert beautiful shelf came from West Elm. It's only available in store in the UK so on our trip to London the other week I bought it and made Jim carry it round with us all weekend! I think it makes the space don't you? It's the perfect place to store our wine glasses, but also some of the cocktail making equipment that we have and a couple of cocktail books. The books we have up there are the Mrs Lillian Cocktail Swatch books - which I love. Jim loves making cocktails and is great at it too - so it's great to have everything right at hand for him. Some of the essential bits of kit that we've found we need are a cocktail shaker, shot measures, straws, miniatures and bitters - I bloody love bitters, especially just in some lemonade. The sideboard was an Ebay purchase bought a long time ago for our old house, and brought back from near Nottingham in the Polo, much to everyone's surprise. It's proved beyond useful since we bought it. The cupboards store some of the cheaper booze we have, bottles of wine, pitchers, extra plates and tea sets and things like silver moule eaters (you know, essentials) and the glass fronted section stores our glass wear. 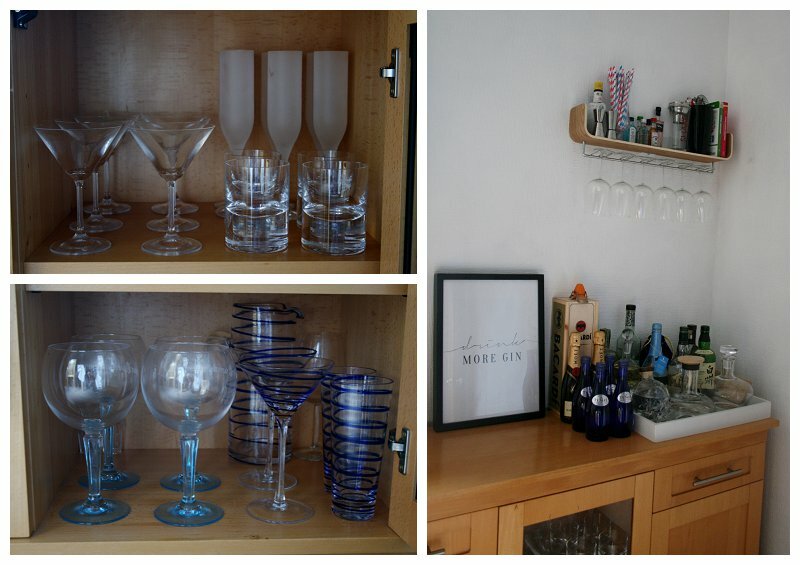 Over the years we've built up a slightly worrying collection of glass wear - martini glasses, highball glasses, tumblers, gin glasses, champagne flutes, wine glasses, shot glasses - we have a glass for every occasion. What do you think? Do you guys have a drinks station at your house? How do you style it? Is there something that you think we're missing? And what cocktails should we be making? We did have a drinks sideboard thing but it doesn't go with anything we want to do in the new place, sad times. The new drinks storage place is on top of the fridge! This looks brilliant though, most excellent hosting...although do I spy paper straws??? I guess you never denied it! I'll take a mojito please. Mojito. Good choice. Now would you like Bacardi or Cockspur in that? I love this - as a big whiskey drinker, I can fully appreciate drink stations. Saying that we don't have one ourselves, at the moment most of the liqour (bar vodka, that's always in the freezer) is just on a shelf in the pantry. Looking for a large vintage tray to somewhat make a station, or just somewhere to keep it tidy and have it out on one of our counters in the kitchen. Kinda hard though finding a tray that'll hold upwards of 15 bottles ... oops. As for cocktails, i'm normally just a whiskey on the rocks, or a whiskey sours kinda girl. Sours are great though, super sweet but you can mix them up with lemon or lime, perfecto. Ooooh. I love an amaretto sours. That's what we need to add to the collection. Jim loves his whisky. He's got a bourbon (is that whisky? ), Japanese, Canadian and Scottish here at the moment. I think a cute tray would be perfect to display your drinks on though. yeah bourbon is an American type of whiskey, i'll have to look into Japanese whiskey myself! I love this! We are hoping to get one but have not yet. Rum and I are such good friends too - I've become a big fan of the zombie recently. So so so much rum!